Use as runners along bedsides on hardwood floors. Great looking, no pulling or sedding at all...feels thiick - nice quality - woud buy again. 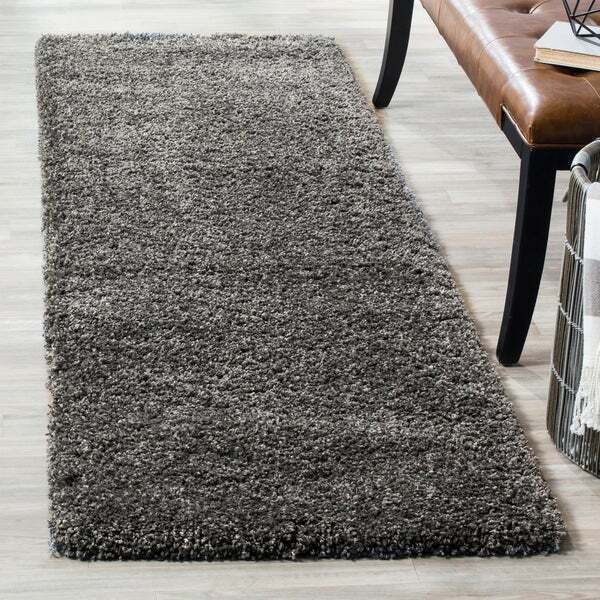 Embrace the casual and carefree West Coast aesthetic with this 2'3 x 5' cozy dark grey shag rug from Safavieh's sensational California Shag Collection. With its nuanced shades of charcoal grey and silver speckled throughout, this plush rug allows for a wide range of versatile styling options. This review goes right along with the Safavieh Milan Shag Dark Grey 2'x6'. They were all ordered at the same and arrived at the same time. They're beautiful and I am so happy with this purchase! They are so thick &amp; plush &amp; soft. Delivery was fast and all of the rugs were packed separately and very neatly stacked at my front entrance. Once unrolled, they look great and feel great when you're barefoot. They do take a little time to have the ends lay flat. I still feel a bit of a bubble or wrinkle in a couple of them so I would recommend unpacking the rugs and laying them somewhere that they have room to breathe for a few days and they may possibly flatten out a little more. Regardless of that, I really like them and they are very dark, neutral and definitely will get lots of compliments. Just like the Safavieh runner rugs, I am very happy with this purchase. 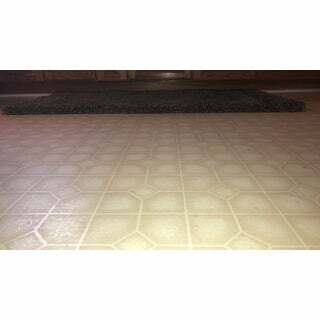 i would recommend this grey shag rug by Safavieh ,when you step on it you will buy more .I did. I just love the Safavieh rugs! I have 4 dogs in the house and I have found these to hold up very well, They are so thick and plush and easy to clean. I love the Grey/Charcoal color! It is very hard to see any dirt on rug. You sure won't go wrong with these rugs! 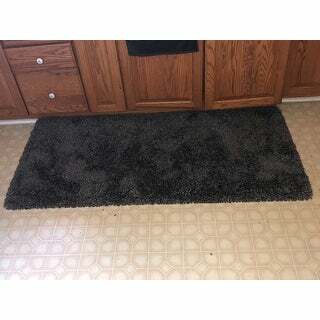 Great quality rug! I wanted to take back the 8x10 that I had bought for the room and replaced it with the larger size of this rug, but couldn't do a return. I highly recommend this rug. It is soft a plush. Excellent rug! Rug looks same as picture. Very nice plush rug. I purchased for my sons bedroom. This is my second Safavieh rug and I love the quality! This is a well made rug because when you try to feel through the plush to the bottom, you don't feel a large patch of nothing, in fact you can't even See the bottom when you try to spread the shag apart. Because of this, it feels amazing on bare feet and not cheap feeling at all! I actually bought it to put on my linoleum because my old dog was not doing well and became leery about slipping when walking to the door (what we do for our pets!). Sadly I was too late, and she never got to try it, so I put it next to my bed, and think about her every time I smoosh my toes into it. I put it over a berber flat/ugly style of wall-to-wall so didn't put a rubber pad under it, but would've done so had I put it on the linoleum.The icey dark gray color is beautiful, and makes it look like the tips are just a bit lighter. I would definitely buy the "California Cozy" line again, and highly recommend it! I hate one star reviews, but..... I don't care for this rug. It came packaged well, it is decent quality, but I was expecting a PLUSH CHARCOAL rug. It is less of a plus and much more of a think acrylic shag. It is not charcoal or even a dark gray; the best way to describe it would be - if the fibers lay to the left, it's a blue/gray slate color; if you lay them to the right, it's a metallic silver color. You can see this to a very limited degree in the pictures, but it is much more drastic when you're looking at it in person (and all the fibers aren't laying in the same direction). I read the reviews, looked at pictures, read more reviews, etc., but ending up ordering the rug anyway. I regret that. That said, I needed a true dark gray / Charcoal rug, but if I didn't have that color constraint - this would have been "ok". In love with this rug ,highly recommend !!!!! Looks like garbage when you unpack them, but they relaxed quickly (about a day) and look very nice. They are soft to walk on but not super soft. Perfect on your bare feet! I ordered 3 of these rugs for my bedroom. They only took a day to totally flatten out. I have them anchored under the bed legs but if they're on hardwood, you'll want to get carpet pads for them so they won't slide. They are so plush and soft under your bare feet. Great value.....and great price. Good gray color, carpet is thick, feels rich to walk on. Would definitely order again. Great quality! I will definitely be a return customer! finishing touches for bedroom remodel. LOVE this rug! I have three in various sizes of the lighter grey and loved those so much in my LR that I got another one in the darker grey for my MBR. It's the perfect size for placing at the foot of a king size bed. These rugs are extremely thick, plush and so so soft! Ships really really fast too. Thank you Overstock for always offering the best stuff at the best prices. This runner was perfect for my kitchen. The quality is excellent and the color is beautiful. Love this rug! So plush and comfy to walk on. Fits perfectly in my space and a great addition to my home. Was delivered on time and in great condition. This is a great runner at a great price. It works well in our master closet and the color and texture is as shown. For the price, the quality is on target and is a great addition to our home. I bought 2 :). I also have the 4 X 6 area rug. At first I was unsure but after time I love all the rugs. I just kept adding more. Now my entire bedroom is almost covered with these..easy fake wall to wall! Just a little double sided carpet tape and perfect. "So these rugs come larger "
Yes, this is available in larger sizes. "is this a runner? 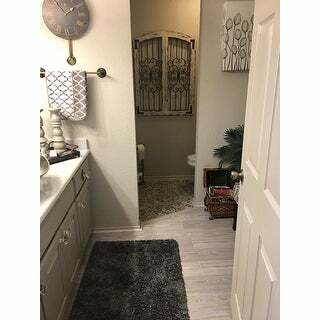 I'm looking for something like this but not sure if it's a runner, 3x5???" It's only 5 feet long but can work as a runner. It needs a few days to fully fluff out but when it does it's super comfy on your feet. Yes it's a runner. There is no rubber backing on it though so you should be careful of the type of flooring it's placed on. Very luxurious rug.